Very scarce original and mostly red! The native's hand has the pixelated effect to indicate skin tone. Be sure to see the Macaulay/Babbington token to see the zoomed-out view the the hand shake. A gorgeous Unc copper example of the scarce Cent. The Sierra Leone comes from 'Lion Mountain'. This is the first of what I consider an 'abolitionist state', with Liberia (USA) following on the British model. The abolitionist movement had strong beginnings in the UK which resulted in the creation of S.L. There will be an interesting history of these two W.African countries in the Library. The second settlement of blacks into S.L. were those Royalists that had left America for Newfoundland. Life was very hard in Newfoundland and many agreed to help start the colony in S.L. The diameter of this one is 31 mm., in between the 32mm and 30mm listing in KM. These were struck by Matthew Boulton at his steam powered mint in Soho, Birmingham, U.K. 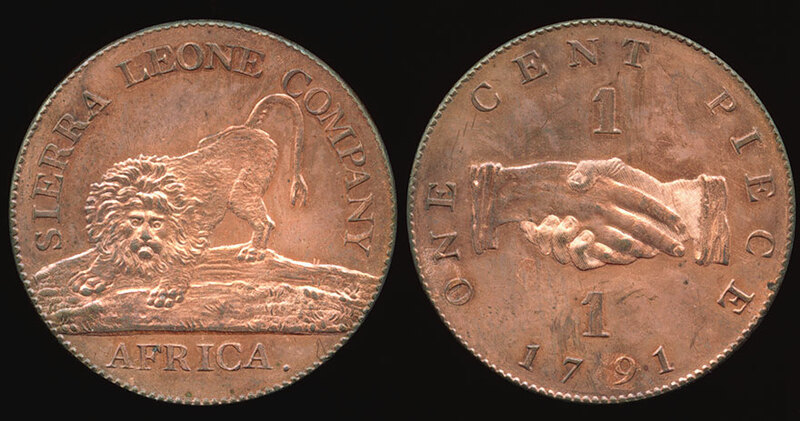 The 1791 date refers to the date of the Company's founding. The actual date of striking began in Dec of 1792, following the end of his Monneron Brothers (see France) issues. A side note is that the 1 Dollar (later 100 Cents) coins were the first coins struck using a decimal series of denominations in magnitudes of '10'. This later issue uses the denomination of 'CENT' which earlier issues phrased as 'PENNY'. Please note the variety here has stippling to denote the dark skin of the right hand and appears to be copper. Soho mint took copper coins and bronzed them, this example is a regular issue in copper, as most of them were.